Not a long show but looks like nothing was clipped. Nonoko’s gimmick is that she uses her breasts as weapons, so if that offends you just keep on scrolling down. Nonoko immediately chest bumps Maho to start the match but Maho stomps her down to the mat. Maho throws Nonoko into the corner and stomps her into a seated position, choke by Maho but Nonoko boots her back and chest bumps to down. Abdominal Stretch by Nonoko, she snapmares Maho and puts her in a modified Cobra Clutch. Maho inches to the ropes to force the break, running body block by Nonoko and she rubs her chest into Maho’s face. Nonoko dances while repeatedly hitting Maho with her chest, Maho fights back with punches and she starts working on Nonoko’s leg. Single leg crab hold by Maho but Nonoko gets to the ropes. Maho picks up Nonoko but Nonoko hits a shoulderblock, running chest attack by Nonoko and she covers Maho for two. Maho trips Nonoko and bites her in the neck, she goes off the ropes and hits a neckbreaker for a two count. Maho goes for a reverse DDT but Nonoko gets out of it, Maho is tripped from ringside which gives Nonoko time to get a big book and whack Maho in the head with it. Boinmaker by Nonoko, and she picks up the three count! Nonoko wins the match. As a quasi-comedy match, this was fine. As mentioned, Nonoko uses her chest for almost all her moves, including her variations of the Cobra Clutch, Boma Ye, and Rainmaker. I couldn’t get a real feel if either are talented wrestlers without that style since the match was too short, but neither looked lost or confused either and the offense was hit smoothly. Decent opener. THERE IS A CRAZY JOSHI CLOWN IN THE RING. I’m excited. Misao and Yuu start the match, Yuu repeatedly pushes Misao to the mat as the super hero isn’t very super. Yuu tags in Nodoka, snapmare by Nodoka and she applies a chinlock. Misao gets away and tags in Mil Clown, Nodoka throws Mil Clown into the corner but Mil Clown moves when she charges in and eventually hits an armdrag. Misao chokes Nodoka with her handkerchief (maybe she is a super villain), she comes in and throws Nodoka into the turnbuckles and and forth. Neck Crank by Misao and she chokes Nodoka with her own arm, but Nodoka gets into the ropes. Misao tags Mil Clown back in and Mil Clown starts working on Nodoka’s leg. Cover by Mil Clown, but Nodoka kicks out. Mil Clown picks up Nodoka and tags Misao, Misao yanks on Nodoka’s arm and throws Nodoka into the corner. Misao twists Nodoka’s arm into the ropes and pulls on it some more, Mil Clown is tagged in and she puts Nodoka in a stretch hold. Nodoka gets out of it, Mil Clown Irish whips Nodoka into the corner but Nodoka flips her out onto the apron. Mil Clown goes up top but cartwheels off of it, shoulderblock by Nodoka but Mil Clown comes back with a dropkick and covers her for two. Shoulderblock by Nodoka and she makes the tag to Yuu, Yuu chops Mil Clown and covers her for two. Yuu scoops up Mil Clown but Mil Clown wiggles away, Yuu picks her up again and this time hits a modified Oklahoma Stampede for a two count. Yuu throws Mil Clown into the corner but Mil Clown boots her when she charges in, Yuu goes for a chop but Mil Clown blocks it and hits a tilt-a-whirl headscissors. Misao and Nodoka are both tagged in, hard shoulderblock by Nodoka and she hits a crossbody, but Misao comes back with a crossbody of her own. Misao tags in Mil Clown and they both elbow Nodoka to the mat, Mil Clown picks up Nodoka and she hits a vertical suplex for a two count. Misao and Yuu both run in, side slam by Yuu but Mil Clown dropkicks her out of the ring. Scoop slam by Mil Clown to Nodoka but Yuu grabs her form the floor, giving Nodoka time to recover. Samoan Drop by Nodoka, but Misao breaks up the cover. Nodoka picks up Mil Clown but Mil Clown rebounds off the ropes and hits a spinning hammerlock slam. Mil Clutch α by Mil Clown and Nodoka is forced to submit! 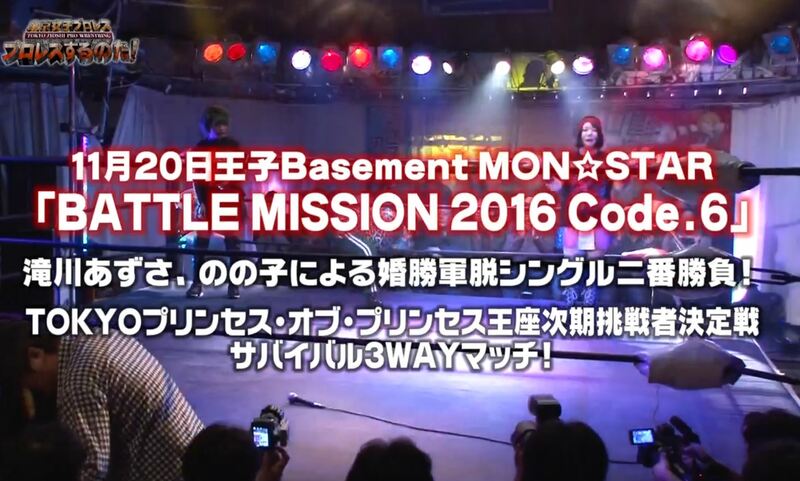 Mil Clown and Hyper Misao are your winners. Mil Clown formally wrestled in Tokyo Joshi Pro as Yuka Sakazaki, she is a quality young wrestler. I wanted to love this one, because I love crazy gimmicks, but I can’t say that I did. There were a fair number of little mistakes, things that just weren’t hit as smoothly as you’d like which took me out of it a bit. No one thing was terrible, just small issues here and there. There were also some match-structure issues like with Mil Clown works on Nodoka’s leg, then Misao comes in and starts working on the arm instead. Misao doesn’t appear to be very good but Yuu and Mil Clown both looked solid. A pretty average match overall, with the high points being leveled out by the lower points. Rika attacks Azusa before the match starts, elbows by Rika and she hits a couple running hip attacks for a two count. Bodyscissors by Rika but Azusa gets into the ropes, Azusa kicks Rika from behind and rams her into the turnbuckles. Azusa stomps down Rika in the corner and chokes her with her boot, hair pull by Azusa and she covers Rika for two. Irish whip by Azusa but Rika kicks her when she charges in and hits a hip attack for a two count. Rika starts on Azusa’s leg, Azusa gets a microphone and talks into it until Rika breaks up the hold. She keeps talking (I won’t pretend to know what she is saying) but finally returns after a few minutes and elbows Rika in the face. Running face crusher by Azusa but Rika catches the superkick attempt and hits a dragon screw. Figure Four by Rika but Azusa gets into the ropes for the break, Rika twists her leg in the second rope before dropkicking it. She goes for a cutter but Azusa pushes her off and hits a Codebreaker, Azusa gets the same big book that Nonoko had earlier but puts it away when the referee looks at her funny. Nonoko then slides the book into the ring so that it trips the referee, Azusa picks it up but Rika avoids her swings. Nonoko comes in but Azusa hits her by accident with the book, Rika kicks Azusa but Azusa pushes her away. Azusa goes off the ropes but she trips on the book, Rika puts her in the Dragon Sleeper but the referee is still out due to his earlier trip. Rika goes over and wakes him up, she puts the Dragon Sleeper back on and Azusa submits! Rika Tatsumi is the winner. I don’t mind a comedy match, or a match with comedic elements, but it has to work. Admittedly, whatever is said on the mic is going to go over my head since I don’t understand Japanese, but having multiple people trip (poorly) over a book was an odd way to go and it didn’t really work. The match wasn’t long enough to make up for that clumsiness, although I do think that Rika in particular looked good with her offense. Clearly Nonoko and Azusa have some comedic flair which isn’t surprising since Tokyo Joshi Pro is owned by DDT, but it wasn’t particularly entertaining in this match. This is a Triple Threat Single Elimination Match, with the winner getting a shot at the TOKYO Princess of Princess Championship. All three trade submission attempts on each other to start with none having any luck, leading to them facing off on their feet again. Syoko and Miyu attempt to double team Akane but she rams them into each other, double schoolboy by Syoko but it gets a two count. This leads to Syoko being double teamed briefly, she rolls out of the ring while Miyu stomps down on Akane. Miyu picks up Akane but Akane elbows her off and tosses Miyu out of the ring. Akane goes out after her and rams Miyu into the apron before throwing her into some chairs. Akane slid Miyu back into the ring, side slam by Akane and she covers Miyu for two. Miyu and Akane trade elbows, a battle that Akane wins, but Miyu kicks her in the knee before hitting a leg sweep. Backbreaker by Miyu, Syoko returns and she puts Miyu in a reverse Figure Four. Akane comes in and hits a body press onto Syoko, picking up a two count. Syoko gets up and dropkicks Akane but Akane absorbs the blows and swats Syoko away. Miyu is back and hits a punch combination on Akane, but Akane pushes her to the mat. Syoko goes for a Tiger Feint Kick on Akane but Akane catches her, Akane then slams Miyu on top of Syoko and covers both of them for a two count. Akane puts them both in a crab hold but Syoko quickly wiggles to the ropes and together they force a break. Akane picks up Syoko but Syoko slides away, schoolboy by Syoko but it gets a two count. Miyu dropkicks Akane in the back, she and Syoko go to Akane but Akane lariats them both in the corner. Powerslam by Akane to Syoko and she lariats Miyu again, Akane picks them both up and hits a double vertical suplex. Akane goes for a double lariat but only connects with Miyu, Syoko gets behind Akane and rolls her up with the Coax (modified schoolboy) for the three count! Akane Miura is eliminated from the match. This leaves Syoko and Miyu battling for the victory. Miyu elbows Syoko but Syoko elbows her back and they trade blows, kick to the chest by Miyu and she covers Syoko for two. Miyu picks up Syoko but Syoko gets away and hits a dropkick. Syoko goes for a double underhook but Miyu shrugs her off and nails a high kick in the corner. Miyu picks up Syoko and hits a judo toss while keeping on an Anaconda Vice, but Syoko gets into the ropes. Running lariat by Miyu, and she covers Syoko for two. Miyu goes for a high kick but Syoko ducks it, Syoko goes for a hurricanrana but Mayumi rolls through it and hits a buzzsaw kick for two. Miyu goes off the ropes but Syoko connects with the hurricanrana, Northern Lights Suplex by Syoko but Miyu gets a shoulder up. Elbows by Syoko but Mayumi connects with another high kick, she picks up Syoko but Syoko slides away and hits a double arm DDT. Syoko picks up Miyu and hits another Northern Lights Suplex Hold, this one while hooking the leg and she picks up the three count! Syoko Nakajima wins! For a small indie show, I thought this was pretty good. Some of the comedy was not my cup of tea but nothing was actively bad leading up to the main event. Plus I got to see a cute Joshi clown. But the main event was legitimately a really entertaining match, just smooth as can be and since all three had different styles the action stayed feeling fresh. 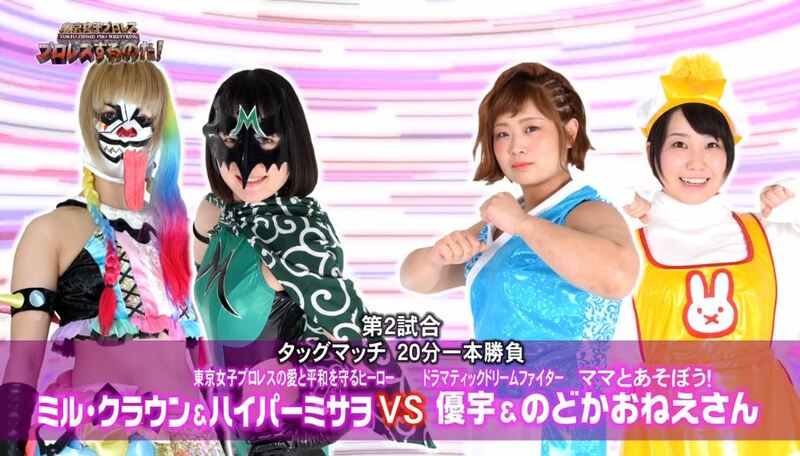 I think all three of them could excel in a larger Joshi promotion, not sure if they will ever get that chance but as long as I can still track down their matches I don’t mind. Probably not worth paying for unless you are really in the mood for something different, but not a bad watch.